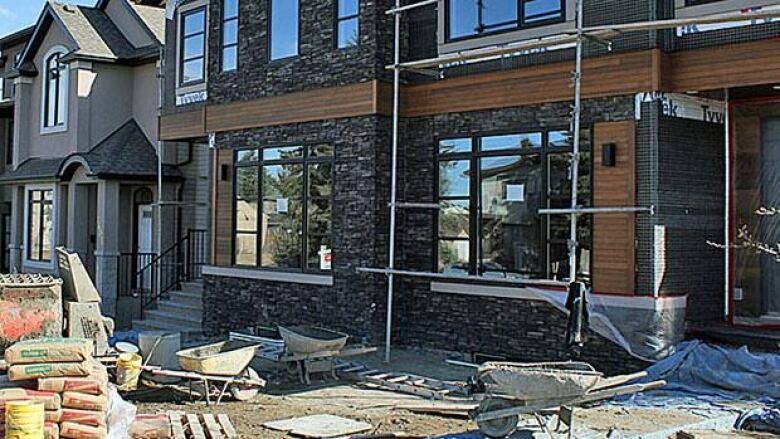 New housing construction rebounded in June, Canada Mortgage and Housing Corp. reported Tuesday, driven by starts on multiple housing units such as condos. And while real estate firm Royal LePage said Canadian home prices in general rose in the second quarter, and predicted they will head still higher in some areas, an economist with TD Bank said housing construction in Canada remains at an elevated level that is "unsustainable." Francis Fong suggested the pace of resale activity has begun to slow, and with new federal mortgage lending rules and an eventual increase in interest rates coming, predicted "this elevated pace of housing construction is likely on its last legs." CMHC estimates there were 20,327 starts in June across the country, up from 18,494 in June 2011. Once those numbers were tweaked to account for predictable seasonal differences, the federal agency said the annual figure for starts was 222,700 last month, up from 217,400 in May. The annual number of starts in urban areas was 199,500 as of June, up by 2.6 per cent on a seasonally adjusted basis, with urban single starts off 0.3 per cent and multiple starts up 4.1 per cent to 132,000. Urban starts for June rose 7.7 per cent in Atlantic Canada, 17.3 per cent in Quebec and by 31.2 per cent in British Columbia. They slipped by 6.9 per cent in the Prairies and by nine per cent in Ontario, where the falling trend continued. In Ontario, starts fell to 70,700 in June, continuing an 18,000 decline in May to 77,700. The Toronto market was the exception, eking out a gain of 600 units to 42,000 on an annualized basis. The number of housing starts nationally has varied significantly over the last few months, according to Fong, but the general trend remains very strong. The three-month moving average climbed above 230,000 units, its highest level since early-2008. And condos and other multiple units dominate. "Multiples now account for more than two-thirds of all housing construction in Canada," said Fong. "On a trend basis, this is the highest share ever recorded. Conversely, single-unit starts fell slightly from 67,700 to 67,500 units and have barely moved from this level for almost two years now." Fong doubts that’s sustainable, given what’s happening in the Canadian economy. Although Canada continues to grow at a modest pace and create jobs, he said, "the elevated levels of household debt and overvaluation in the housing market do not support these construction levels," predicting the pace above 200,000 won’t last beyond this year. For the hot Toronto market, TD Economics is predicting starts will fall to around 35,000 units on an annual average basis within the next two years. The Royal LePage report suggests the national residential real estate market is at a tipping point, with some areas likely too expensive for buyers at the current levels. The firm says average prices nationally for one-storey bungalows, two-storey detached homes and condominiums all went up in the April to June quarter. The average for bungalows was $376,311, up from $356,625 in the same quarter of 2011 and $356,306 in the first quarter of 2012. Two-storey detached home prices averaged $408,423, up from $390,163 a year-earlier and $398,282 in the first quarter. Condos averaged $245,825, up from $238,064 from a year ago and from $243,153 in the first three months of this year. "Home prices cannot grow faster than salaries and the underlying economy indefinitely," Royal LePage CEO Phil Soper said, adding that "some regions have reached or perhaps even exceeded the current upper level of price resistance as buyers have embraced an era of historically low mortgage rates." Emanuella Enanajor, an economist at CIBC, says slowing mortgage and consumer debt accumulation indicates that housing prices may dip about 10 per cent over the next year or so. "Interest rates support demand for housing," said Enanajor. "However, rates are flat. They're not going down. They're stable. And the impact of those stable, low rates is fading." Soper described as "unfortunate" the timing of federal changes to mortgage eligibility, which took effect yesterday, suggesting that they come at a time when the market was slowing of its own accord. He said the cumulative effect of tighter mortgage eligibility requirements over the last four years "will keep some people on the sidelines, particularly first-time buyers who account for up to half of the transactions." The federal changes announced last month lower the refinancing limit to 80 per cent of home equity and limit the availability of government insurance to mortgages of $1 million or less and with amortizations of 25 years or less. Most of the major cities tracked by Royal LePage showed increases from the first quarter of 2012 and the second-quarter of 2011. There were a few exceptions scattered across the country, however, with some types of homes in some cities showing lower local average selling prices. In the West, for instance, the average price for bungalows sold in Victoria fell to $460,000 from $470,000 in the first quarter and $475,000 in the year-earlier period. In the East, the average price for bungalows sold in Saint John, N.B., fell to $175,037 from $191,000 in the first quarter and $179,950 in the second quarter of 2011. Both cities also showed lower prices for two-storey detached and condos compared with a year ago.